Recycle for Wales has teamed up with the Cardiff Half Marathon and Brecon Carreg to celebrate Wales ranking as 3rd in the world for recycling by revealing the energy secrets of plastic bottles and banana peels recycled at the race and at home! Can you really power Cardiff Castle with water bottles? And how many recycled banana peels would it take to charge your phone? The 13mile Half Marathon course takes in some of south Wales’ most fantastical landmarks. 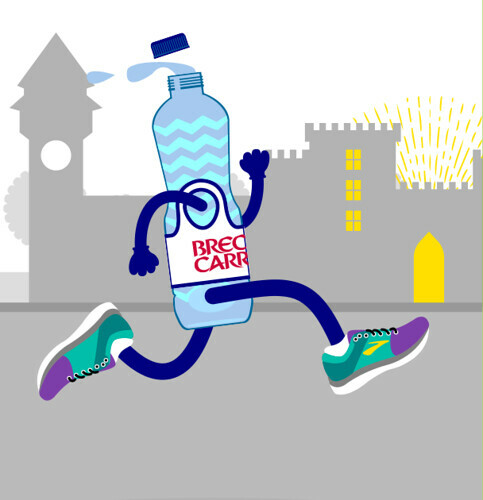 If every Cardiff Half runner recycled their water bottle it would save enough energy to power Cardiff Castle for more than 2 days . Don’t forget that bathroom plastic bottles - such as shampoo, body wash and hand wash - can be recycled too! Are good tunes an essential part of your training programme? Then make sure you recycle your banana peels as the energy created could help to ensure that your phone doesn’t run out of juice. One recycled banana peel could generate enough energy to charge your smartphone...twice! Whether you’re resting after a long run or putting your feet up after a hard day at work, your recycling can power your favourite TV series. 1 recycled water bottle would save enough energy to power your TV for 48 minutes. That’s almost enough time for an episode of Black Mirror, Stranger Things or Celebrity Masterchef. How can plastic bottles and banana peels create energy? A banging cooked dinner is an essential part of any Sunday – whether you’re running the race or not. Your recycled fruit and veg peelings could help ensure the feast is ready for lunchtime. 67 recycled banana peels could power an oven long enough to roast a leg of Welsh lamb. Yummy! In most places in Wales and the UK, banana peels and other food waste, when recycled, are taken to a special processing plant and turned into energy to power our homes, local communities... AND some of Wales' most loved landmarks. We use up to 95% less energy to make products from recycled materials than raw materials. Recycled plastic bottles can also be transformed into all sorts of fabulous new things such as t-shirts and fleeces, as well as new bottles. What kind of of recycler are you? Would you like to help Recycle for Wales with some research into recycling in the home? By agreeing to take part in the survey you will be entered into a prize draw to win a £100 gift card for One4All. All you have to do is provide your name, email and telephone number in the form below and one of our researchers will be in touch. By you providing your name and email you will be entered into a prize draw for a One4All milti-store gift card. Your email address will only be used for this research and won’t be added to any mailing list. Any survey responses that you give to us will be held for five years and may be used for other Recycle Now research but will not be passed to any organisations other than those commissioned by WRAP. Anonymised data may be published or shared with other organisations. Wales is 3rd best in the World and 2nd best in Europe at recycling. Help us become number one in the World by recycling everything you can. Unsure about a particular item? Use our Recycling Locator below to find out everything you need to know about what can and can’t be recycled in your area.